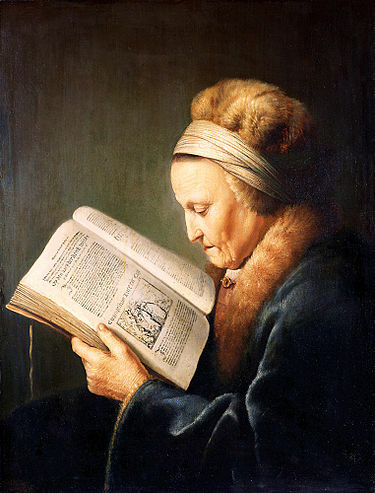 So You Think You Have Problems | "Northern Crossings"
More artistic influence – this is a portrait of Rembrandt’s Mother reading a lectionary. The church lives in the rhythm of confession and absolution. We have ordered worship in such a way that we can tell the story of salvation through Bible readings in a comprehensive way throughout the year. We call that the daily lectionary for individuals and a pericopal system for reading in church. Every Sunday we have lessons from the Old Testament, Epistles and the Gospels that follow order and time. Our church bulletins have the readings on them since most people don’t carry their Bibles with them to church any more. There is a concern that people don’t read their Bible at all anymore and therein lies a tale. In order the try and get more people to hear more of the scriptures, the folks that study such things are working to add longer lessons to be read every Sunday. They are, I was told, trying to get 15 minutes of readings for each Sunday service. I have no problem with that but these people do not understand that most Pastors out here in flyover country have more than one church. When I came to North Dakota back in the 70’s most of North Dakota Pastors had two churches, now we have many three point parishes. Reading 15 minutes of lessons creates a travel time problem. It is not a chore but by the end of the day it can become tedious and there is a chance to lose one’s voice. The solution of course is to have various readers but that has its own issues. Folks will read as volunteers until the Old Testament lessons get to stuff like anointing Hazael, and Jehu son of Nimshi and Elisha son of Shaphat from Abel Meholah and the language gets to be a tough pull – read it yourself in 1 Kings 19. There are folks that have told me it is the Pastors job to read the lessons and they are mightily offended when someone else does, so the volunteer help issue can be an issue. Anyway, we are coming to the apex of the issue this Sunday known as the Sunday of the Passion or Palm Sunday. The Gospels are really Passion histories with extended prologs. The passion is the recital of the arrest, beating, trial and execution of Christ which is the reason He came to the earth. His suffering and death was the will of the Father to fulfill His justice and make us His righteous children through faith in Christ. Passion Sunday is an affront and an offense to all moralistic thinking but it is the fulfillment of all that the Scriptures have to say about the One who came to be a “ransom for many”. Yet the Passion story is told in a passionless way. It reads like the old time “Who, what, when, and why” news articles or the old “just the facts mam” Joe Friday laconicism. The story of Jesus suffering and death is terse and taunt and economical but devastating. Anyone who can read the reaction of Peter when the rooster crows and keep their composure has to be a tough not to crack. Anyone who can read of the gambling over Christ’s robe, the only thing He owns, and not choke up a bit has ice in their veins. Yet the story covers two chapters of one of the Gospels and it is exhausting. Finally, there is the issue of sight. Longer lessons on one half of an 8 1/2 x11 inch page gets pretty small. Reading the Passion history and understanding that it happened for you, that Christ died for you, and sacrificed Himself for you is hard to read on that small page. Doing it with tears in your eyes is almost impossible. The Same Sun That Melts the Ice, Hardens the Clay – Mercy that Destroys. What Chance Have I Got?